Yeah, I know. You took one look and you knew she was a genius. Ha! I'd been planning on doing this sketch for a couple weeks but I didn't have the time to sit down and work on it. 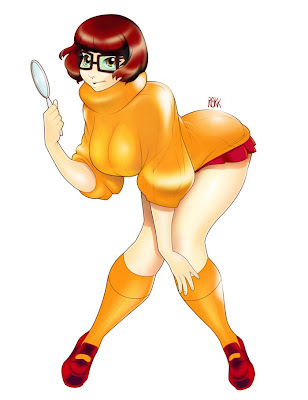 I'll admit that I liked Velma back when she was built like a brick house. The only problem was that she was a little to butch. When she got redesigned in What's new Scooby doo they made her mousy and petite. I got no hate on it, I just missed how big she was. All in all, she fit the kind of character that I would like to add some unnecessary pounds too. Ha! Thats funny Jo. I hadn't considered Daphne cause she's already so popular. If I can make it work, I'll give it a try. I already started on a comic character that Steve asked me about a while back. Thanks guys! Glad ya'll like it.